Rotel is about the easiest dip you’ll ever make. Even my six-year-old nephew could do it, if he were allowed to cook with actual heat. For now, he is content with such concoctions as “Chocolate, Cheez-its and Applesauce Delight” or “Peanut Butter, Jelly, and Water Surprise.” What do you dip in Jackson’s dips? He recommends chocolate. Here’s the recipe for Rotel: Take a brick of Velveeta and add a can of Rotel. Heat and serve. We also like to doctor up the dip with some ground beef or sausage (pre-cooked!!). And it’s best to make Rotel in a Crock-Pot so you can keep it warm. Cold Rotel is frightening, my friends. Just remember to turn the heat from high to low before guests arrive. There’s nothing worse than lifting a lid off the Crock-Pot to discover a crusty, burned cheese-like substance. Well, except being the one who has to clean that mess up. A few years ago at a Christmas party, I encountered Rotel in which the traditional Velveeta had been replaced by CREAM CHEESE. WHY didn’t I think of that? It would have saved me hours spent on grocery store scavenger hunts trying to determine where they’d stashed the Velveeta. You’d think they’d put it in the dairy case with the rest of the cheese, but I think store keepers have this sadistic need to remind folks that Velveeta is a “cheese product,” not actual cheese and therefore does not require refrigeration. Honestly, if I hadn’t grown up eating Velveeta, I don’t think I’d touch the stuff. And now, thanks to cream cheese, I don’t have to. Ok, then, moving on to what all may be dipped in Rotel. 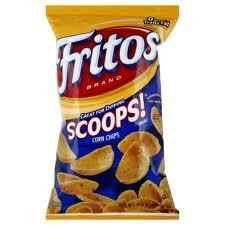 I, myself, do not stray too far from the classic Fritos (though I prefer the newfangled “Scoops” variety, which greatly improves the dip to chip ratio). Some folks prefer tortilla chips, which are fine (just not as good as Fritos). There might even be some folks tempted to dip crudités in Rotel. But who invited them? Potato chips and Rotel are an iffy combination. To my mind, most potato chips are too flimsy to stand up to a meaty Rotel, but could probably handle the cheese-only variety. Whatever you do, don’t serve Rotel with Cheetos or any off-brand cheese puff. This is overkill. Also, Doritos should be avoided, if at all possible. In an emergency, you might could get away with the nacho cheese flavor, but Rotel plus “Cool Ranch” is a recipe for disaster. Why do Southern people love Crock-Pots? Two words: Rotel dip. Sure, this kitchen appliance is handy for making stew, chili, soup, whatever, but for Rotel, well, it’s indispensable. If you’re wondering why, my guess is you’ve never tried cold Rotel dip. Heed these Johnny Cochran-esque words of wisdom: if the Velveeta isn’t hot, step away from the Rotel pot. Now, if you’re balking at Velveeta, you may want to steer clear of Southern get-togethers on general principle. American cheese (or cheese-like substance) tends to play an active role in everything from Rotel dip to piggies. Crock-Pots also make a mean batch of barbequed meatballs or lil smokies. Only problem is transporting your Crock-Pot to the party and returning home unscathed or unscalded. Even though Crock-Pots are fairly sturdy, they’re not indestructible, so be careful who you lend your Crock-Pot to. Case in point: My sister’s husband took her Crock-Pot to work once and failed to return it in one piece (or actually two pieces since it was one of the new-fangled “removable stoneware” types). Of course, he never heard the end of this. Probably still hasn’t. She was nagging him about when he was going to replace her Crock-Pot, and he said was planning to buy her a new one for Christmas.